Learn how InteQ's InfraDesk 5.0 helps improve service desk strategy through increased service delivery and operations. InfraDesk 5.0 is an on-demand service desk application that's delivered over the Web. It's based on InteQ's ITIL process automation approach. With embedded ITIL-based processes, InfraDesk 5.0, from InteQ Corp., includes service-level management, configuration management, approval engine, change management, user interface, workflow automation, and reporting and integration capabilities. The enterprise service desk application also has a global search function, which allows IT professionals and end users to find and log solutions. It defines service targets and thresholds with service-level agreement (SLA) management. 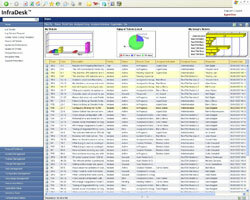 It holds relationships between all system components with a configuration management database. Global Search and its canned searches have pre-defined queries that find information about making business decisions, managing services and measuring trends. It enables integration with third-party applications and service providers through several engines. System requirements: A supported Web browser such as Internet Explorer. Pricing: A per-user license fee with a one-time implementation fee. Fixed-user licenses are $95 per user, with the option to add floater licenses at an additional cost. Implementation fee is $7,500.